Stockwell Labour Party will have a stall with information on our campaigns and a chance to talk to your local councillors. 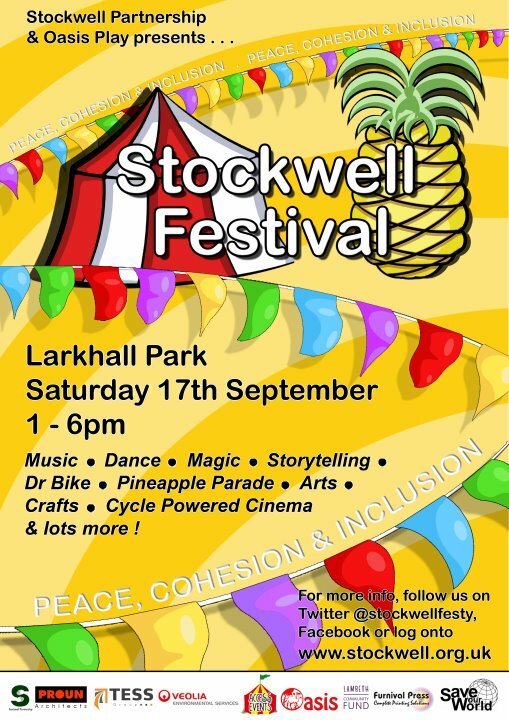 This year the Stockwell festival will be spread across five sites: Larkhall Park and Playground, Oasis Nature Garden, Go Kart track and Adventure Playground, and it is a joint project by Stockwell Partnership and Oasis Play. The theme this year is Peace, Inclusion and Cohesion. On the Pineapple Stage there's a vibrant line-up with hillbilly bluegrass from the Glenbuck Cherry Pickers, jazzy blues from Marcina Arnold and the Love Rats and steel panners Southside Harmonics. Plus dance moves from Dance Starz, acrobatic cheerleaders Fyer Flyz and Confusion. Don't miss the famous Pineapple Peace Parade, face painting, arts and craft workshops, magic and circus workshops, interactive drumming workshops, the Bureau of Silly Ideas Pineapple Car, local artists, an opporunity to paint messages of Peace on the Giant Peace Wall, Stockwell stories and songs from local residents. Services on site include Dr Bike who will give you advice and mechanical know-how on your bike. Friends of Larkhall Park exhibit the latest park developments. If you’d like to volunteer on the day, please contact Anna at agodsiff@hotmail.com or call 07973 71117.